The Ramada Bintang Bali Resort is just a 20 minutes walk to the Village of Kuta to enjoy the nightlife and shopping district, Balinese culture and people. The excellent location right on the white sandy beach is recognised as one of the most beautiful on the "Island of the Gods". Sunsets are famous and spectacular. 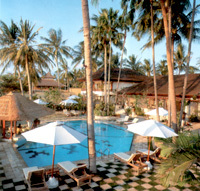 Just a five minutes drive from the airport and close to Nusa Dua, Sanur and Denpasar. A total of 401 rooms and suites set in more than six hectares of exotic Balinese garden extending down to the beach front. 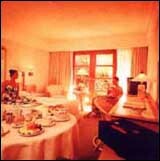 These rooms include 48 Superior Rooms, 12 Suites, 4 Deluxe Suites, 336 Deluxe Rooms and 1 Presidential Suite. All of our luxurious suites are fully appointed with every comfort you might expect in a high standard holiday resort. All rooms are with private balconies or terraces. Balinese interior design elements add yet another special flair to your comfort. You will indeed experience all the best of a luxury first class international hotel which does its utmost to turn our Paradise Island into a dreamland. All rooms feature Air Conditioning, IDD phone, Mini Bar, In-house Video, Private Bath and Shower, Multi Channel Radio, Satellite Television, Private Balcony/Terrace, Hairdryer, Coffee & Tea making Facilities. Free form Swimming Pool with Jacuzzi and Cold Dip, Restaurants and Bars, 24 Hours Room Service, Safe Deposit Boxes, Laundry and Dry Cleaning, Duty Manager 24 Hours, Children's Playground, Hospitality Desks, Secretarial Services, House Clinic, Games Room, 2 Floodlit Tennis Courts, Gymnasiom, Aerobic Room, Sauna and Massage, Private Beach and Water Sport Facilities, Conference Facilities and Separate group check in and check out areas for efficient registration and luggage handling. Transportation Service, Photo Service, Bank, Car Rental, Taipan Karaoke Super Club, BB Discotheque, Shopping Arcade, Beauty Center and Spa. 4 Nights accommodations at Superior/Deluxe Room, Sunset Dinner Cruise, 2 hours Lulur spa treatment for Couple, Photo of Balinese wedding Costume; Bedugul Tanah Lot Day Tour; Lunch and dinner in the top restaurants; Uluwatu Tour; Kecak Dance and jimbaran BBQ Seafood cafe; Watersport (Package of Parasailing, Banana Boat and Jet-Ski) and Free time with your Spouse, Return Airport Transfer, Air-conditioned Car with Guide at your choice or languages.